Hi, I love the blanket.. Did you just sew the fabric onto the blanket? thanks! yes I just sewn the fabric onto the edge of crochet blanket and made some small stitches in the middle to secure it. Did you use a machine or by hand? What hand stitch did you use and did you put any stitches in the middle? It is blanket stitch, I did put some stitches in the middle to secure the liner. Would you be willing to provide the whole pattern?! 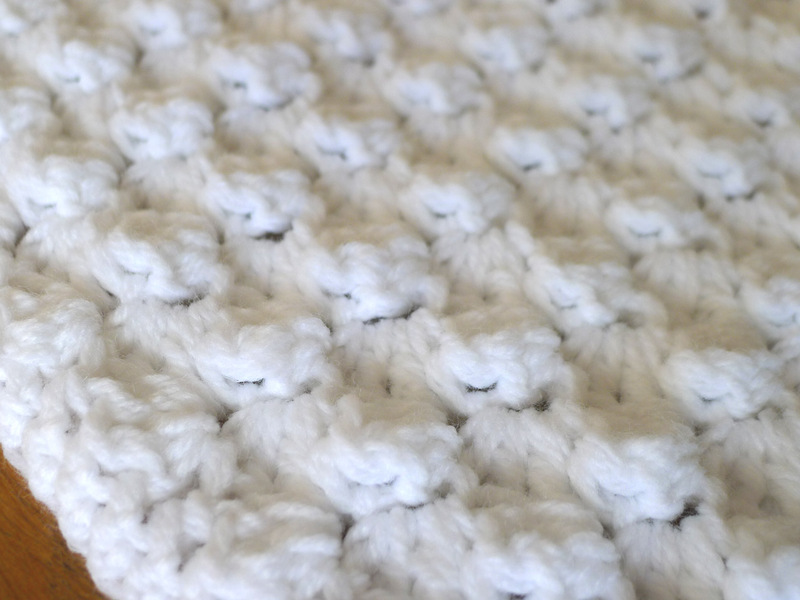 I’m familiar with crocheting but don’t really sew, so I could use some specific directions! Thanks. So I was wondering. . Can I use the chainless foundation on this type of pattern? I hope so because I have a hard time with the chain. I tend to make it tight and it starts curving. I’m not sure about that, haven’t tried it, what would you replace the chain with since it still need the base to hook the stitch. I haven’t learned crocheting that much and I’m curios too if we can do one without it, let me know how is the outcome. thanks for visiting! I have found that the single crochet foundation stitch to have too much give for anything other than for the neck area. Mine are always too “loose” for patterns that require a uniform size. Love this and would like to make one for my first grand baby to be born in Sept! 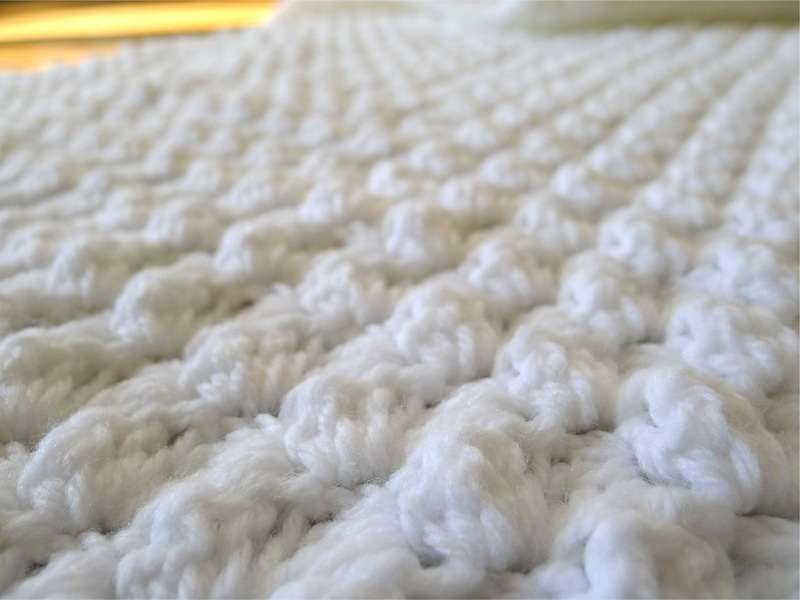 What border stitch did you use for the crochet part of the blanket? Thanks! Thanks.. and congratulation for your grand baby. It’s single crochet all the way around and repeat couple row. Your blanket is precious! 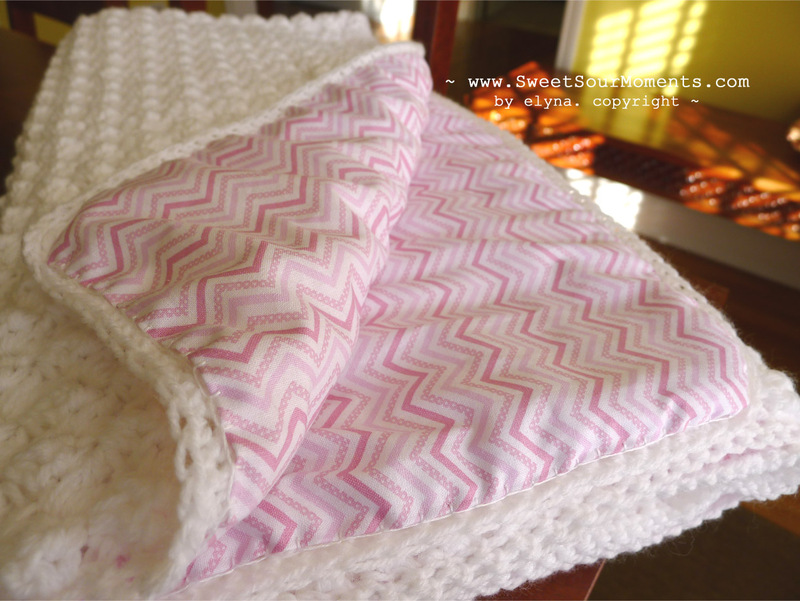 What size fabric did you use and what size was your blanket? Or is all of this in the tutorial? Thanks Melanie! The blanket size is approx. 1yard x 1.5yard, the fabric lining is just a bit smaller than the crochet blanket. Thank you so much for this gorgeous pattern and the helpful information for lining it with a soft fabric. Love it!! you are welcome Tina, thank you for visiting! Your blanket is gorgeous! 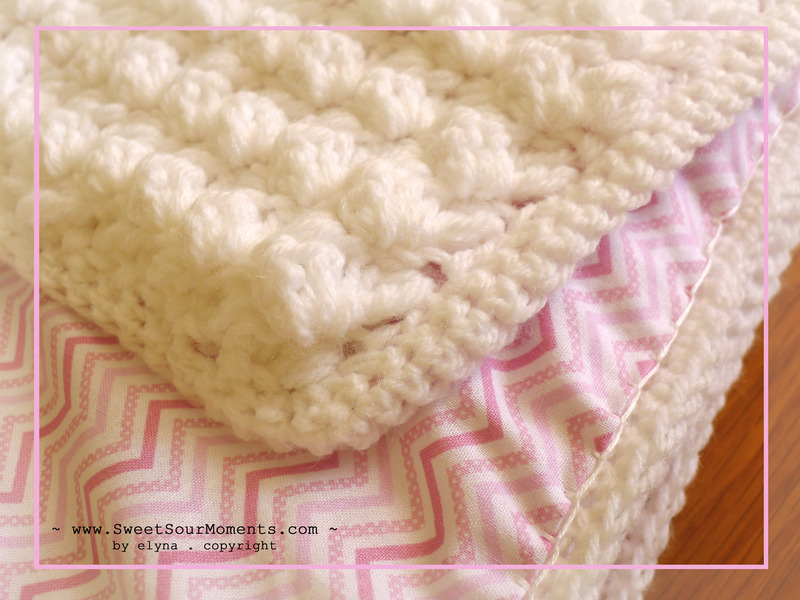 Thank you for sharing this information on how to sew the material on the crochet blanket. I’ve been wondering for a long time but never could sew it on my sewing machine and it would get messed up. Just question how well does the blanket hold up after washing it. You are welcome… I wash it in delicate setting. It still looks good until now. Elyna – this is perfect! Have 2 babies due this winter, to be born in the Sierra & Rockie mtns. Brr-rr. Thanks, you’ve given me lots of ideas. him/her from getting their toes and fingers caught in the crochet material. 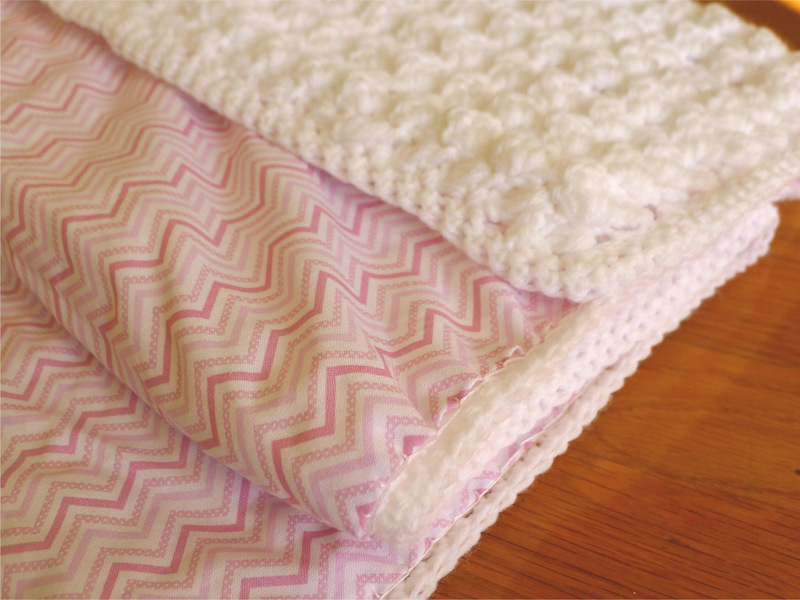 I tried make this blanket and I give lining but the problem the lining running around, bit hard or maybe I have to use the straight material? You could lay the blanket on the flat surface then align the lining fabric on the top of it with the help of some pins before sewing it. hopefully it helps. You do beautiful work! The lining Is such a wonderful idea. What stitches did you use for the border? Is it a round of slip stitches then two rounds of single crochet? I love this blanket..Can you please tell me how many skeins you used? thank you… I think it’s about 2.5 big skeins.